Restore auto glass to like-new clarity! CarPro CeriGlass is a special glass polish developed from the innovative optical polishing compound, Cerium Oxide. This remarkable formula removes hard water spots that are attached on the glass like scales! Your vehicle's windshield and windows will have like-new clarity and smoothness after polishing with CeriGlass. The Ceriglass Kit includes 150 ml. Ceriglass, two foam applicators, and a microfiber towel. 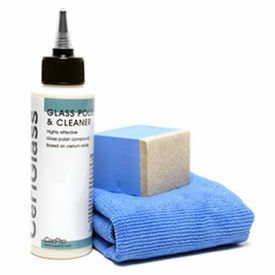 Formulated with mild abrasives, CeriGlass deep cleans and polishes all glass surfaces with ease. It quickly removes acid rain spots, hard water spots, road film, stubborn bird stains, and interior glass film. CeriGlass is so effective, it even removes fine to medium scratches from glass! It leaves glass crystal clear and sparkling. Use Ceriglass by hand or machine. Hand polishing is effective at removing mild water spots. If you want to remove widespread, severe water spots or light scratches, work with a rotary or orbital polisher and a glass buffing pad. When used with an orbital buffer, this polish can remove surface scratches from glass that are caused by salt and road dust that binds to your windshield wipers. CeriGlass contains no strong dissolving agents, which can damage your skin. CeriGlass is a mild abrasive polish proven to work on glass without distortion. It can also be used to clean and brighten chrome and other metals and to polish hard plastics. Before you give up on your scratched, spotted glass, use Ceriglass. Great for polishing Plexiglas and restoring headlights. Removes tiny pinhole pits in glass windows and polishes away fine wiper scratches. We recommend using face mask while using a polishing machine to prevent inhalation of polish powder. Apply small amount on the glass polish pad or a hand applicator. Cover the car panels and rubber seals with nylon film to protect them from powder dust. Buff thoroughly over the entire glass surface in a circular motion. Rinse the surface with water. Wipe off with microfiber towel and check your work. If necessary, repeat the process. Always try CeriGlass on a small test spot to be sure it does not mar or scratch the surface.